Wednesday January 9th 1884 I was at home at work all day made a comfort for my bed and worked some on my edging. Thursday January 10th 1884 I washed again this morning and in the afternoon I got my things fixed to go to Burlington tomorrow. 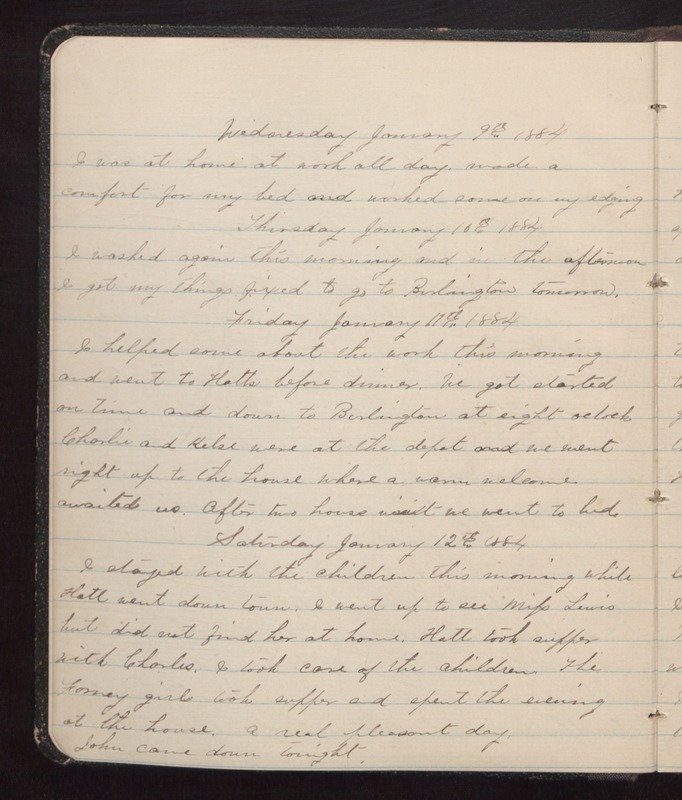 Friday January 11th 1884 I helped some about the work this morning and went to Hatts before dinner. We got started on time and down to Burlington at eight oclock. Charlie and Kelse were at the depot and we went right up to the house where a warm welcome awaited us. After two house visit we went to bed. Saturday January 12th 1884 I stayed with the children this morning while Hatt went down town. I went up to see Mifs Lewis but did not find her at home. Hatt took supper with Charles. I took care of the children. The Forney girls took supper and spent the evening at the house. A real pleasant day. John came down tonight.